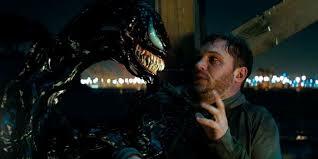 Venom was a surprisingly well done plot and story with just a few distracting plot points that almost didn't make sense, except, that they had to happen. Oh, and the Marvel humor we've all come to enjoy in these movies, well, it was underdone to absolute perfection! Any future Avengers films should take note! I've seen the reviews for Venom and if you fall for or follow such, you may be deterred from going to go see it. I almost was. But for the Marvel/Venom fan, this film hits all the points you would expect it to hit and does so rather well, making this a definite must see film. 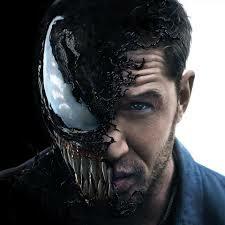 Venom, stars Tom Hardy, Michelle Williams, Riz Ahmed and was directed by Ruben Fleischer (Zombieland, Gangster Squad). The film spends the first act and part of the second act actually developing our world of characters. I was expecting to see things happen pretty fast and we get into the slug fest that many Marvel films trend to do, but instead, I was pleasantly surprised by the true effort to give us a background on all the characters without depending on the titular character. This film has the classic, well-timed, sense of Marvel humor we all have come to enjoy. But instead of hitting us with quip after quip after quip, the humor is parsed out sparingly and is a pure joy to encounter when it does hit you. Hats off to Fleischer for taking that path. In fact, he's accomplished what WB/DC has never been able to do well... create a good dramatic story and have good humor in spots. So if you're a Marvel/Venom fan, this film hits all the spots just right with the character. The film delivers wonderfully in that regard. But there are a few moments that scenes or moments make harsh right turns to connect one scene or development to another. These quick connects feel like lazy writing (as Deadpool would put it) or maybe, content was edited out to cut the film down to a required length. Hence, for non-Marvel fans or critics, will be their focusing point and why some critics were pretty harsh on the film. Venom sounds exactly as I had always imagined he would when he talks. The dialog between Brock and Venom is wonderful, stressful, and at times, funny. The film starts out as we watch a private space shuttle returning from a long trip, as as they are about to enter the atmosphere, you can hear the crew members starting to scream as they lose control of the shuttle and it plummets to Earth in an uncontrolled flaming spiral before slamming into the ground. The shuttle was carrying living specimens of an unknown alien species. We watch one crew member seemingly having survived this impossible crash, but only long enough to transfer an entity to an unsuspecting EMT. We switch gears and meet Eddie Brock (Hardy) and his fiancee (Williams) as she trots off to her job and he, to his. He's a reporter with an edge for uncovering the dirty truth and exposing that which people don't want exposed. Brock is given an assignment to interview Carlton Drake (Ahmed) to talk about his shuttle space program and how it will recover from the disaster that we saw in the opening scenes. Plus, he laments on how helping humanity survive, we must look to the cosmos for answers. (We know better since we've already seen his motivation) But it's during this interview that Brock ticks off Drake when he starts asking him about some secret experimental programs that put human lives in danger. Brock gets fired for overstepping his boundaries of the interview but several months later one of the scientists that works with Drake can't take it any more and reaches out to the jobless Brock, saying that she can help him get the evidence he needs to expose Drake. But things go horribly wrong for Brock and he finds himself the victim of being joined to one of the alien specimens that Drake had brought back on his ill-fated shuttle. The specimen, or symbiote, as it wants to escape it's imprisonment that Drake has forced in it, for his studies. And let the fun begin!!! As the story develops, Venom goes from wanting to take over the Earth with his other symbiote buddy/boss and the rest of their species, to wanting to stop his fellow alien, Riot, from bringing his brethren down to Earth. But the source or reasoning of this bond felt weak and it diminished the character of Venom a bit. OH, I'll get over it. I love Venom. But it was a bit of a distraction for me. That and how quickly he changed his tune about conquering Earth. This film was worth every penny I spent seeing it. Is it a good 3D opportunity? Maybe. 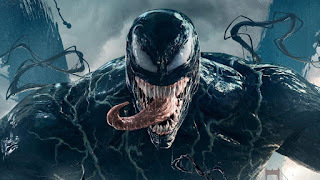 Venom is squishy and at times has a lot of tendrils flailing around and that might get a bit confounding in 3D, but I'm not sure. I watched in 2D and was perfectly entertained. Sure, the story had a few flaws, but the time taken to develop the characters in the first half of the film was a nice change of pace. Watching Venom do his thing was awesome. Seeing the two, Brock and Venom, finally start to work together was sublime! There is a mid-credit scene and a post-credit scene and I AM GOING TO SPOIL THEM FOR YOU HERE. The mid-credit scene wound me up in a fantastic way, because Eddie is going to interview a criminal by the name of Cletus Kasady and during their conversation, Kasady says that when he escapes, "There's gonna be carnage!" OMG... so judging from his RED hair, and that reference, we know know they are planning on bring out the red symbiote named Carnage! And the best part? If this casting sticks, Kasady was played by none other than Woody Harrelson! The end-credits scene had absolutely nothing to do with Venom or the next phase of any upcoming live-action Marvel movie. It was a clip or teaser from the upcoming animated feature: Spider-Man, Into the Spider-Verse. It initially frustrated me to hang around so long to see something not related to Venom or the live-action film world, and from what I have read, it was not the director's call to include this blatant sales pitch in there either. Makes sense that Disney would pull weight on this. But it was actually fun to watch. But gads, I HATE hanging around through all the credits when all I want to do is the heck out of a theater!! !